Wow, I’ve been extremely busy this week and this Journal entry is pretty late! Because of that I’m going to keep it short and sweet. Last week I had a very stable digestive week, possibly slightly improved from a BM stand point. I’ve been trying extremely hard to get at least a cup of goat’s milk yogurt each day and I think it has been really helping my stool quality. I did add a few new variables to my diet last week. I added watercress to my diet and didn’t react to it. I couldn’t find any watercress by themselves instead I found a frozen vegetable mix that contained watercress. I made what is going to be a new staple in my diet… a quick and dirty stir fry. I browned 2lbs of ground meat and added the whole package of mixed veggies. I then added some red wine vinegar, a bit of honey and some spices (salt, pepper, cayenne pepper) to achieve a very nice sweet and hot flavor. I also added some jalapeno peppers to the my diet. I started by using some fresh peppers de-seeded and cooked in a dish early last week and then later I found some pickled Jalapeno peppers that don’t have any extra ingredients. I used them in my quick and dirty stir fry above to add a bit of PoP! Just be careful with the Jalapeno’s, they can really inflame the digestive track if they aren’t used in moderation. My allergies are still killing me and I’m having a hard time breathing through my nose but when I can breathe I can usually smell! At this point I really just wish I could breathe better (don’t get into see the allergist for another couple months). Over the last month I’ve attended several events in which I knew I would love a summer cocktail but wouldn’t be able to drink anything the host was providing. With the 4th of July holiday weekend approaching I figured I would share my current favorite SCD legal summer cocktail recipe. After trying several recipes I have to thank Carrie Floyd over at Culinate Kitchen for posting the Kimmy drink because it is by far my favorite. I put an extra spin on the original recipe and made a party sized batch so I will put those measurements in quotes. The prep time is a bit more than usual because of the mint syrup but it’s not as bad as the many summer cocktails that contain pounds of fresh fruit that need to be diced up. 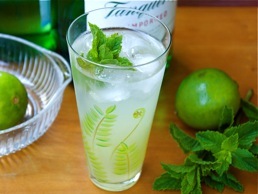 It has an awesome fresh taste that is somewhere between a gin and tonic and a mojito. The drink can also be made non-alcoholic by removing the gin and using extra club soda (non-flavored carbonated water). Make sure to pour the drink mixture over a glass of ice when serving and if your making the party sized drink use a container that is around 1 gallon in size. I want to wish everyone a safe and fun holiday weekend (for readers in the USA). If anyone else has a great SCD legal summer drink recipe please post it below, Thanks. Relax and Enjoy!